Whether it’s one you own or one your rent, just about any size and type of boat affords you the chance to explore distant waters. I thoroughly enjoy cruising and exploring new waters by boat. And what’s great is that you don’t need a cruiser to do it. Whether it’s one you own or one your rent, just about any size and type of boat affords you the chance to explore distant waters – you simply have to seize the opportunity to get out there. Last September, my wife Lisa and I left our cruiser in Georgian Bay and headed to the Kawartha Lakes region to enjoy some early fall day boating. 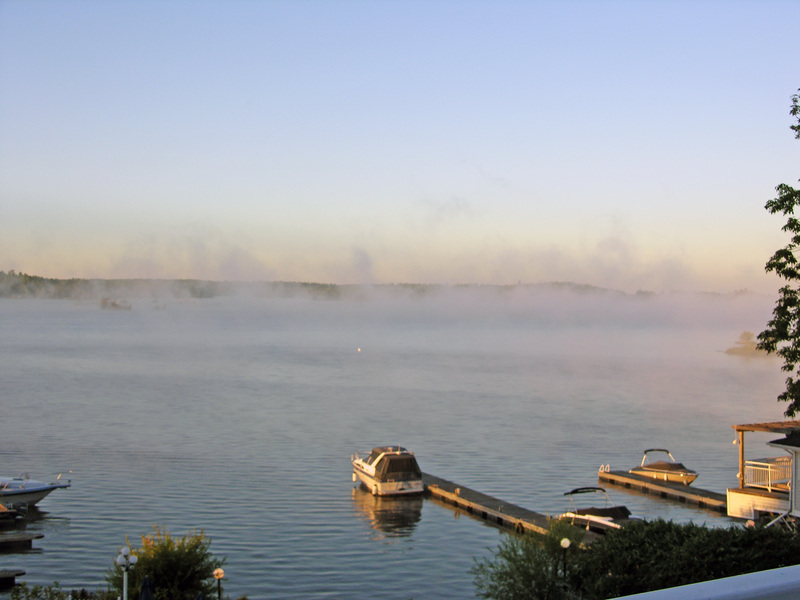 We had selected the Stoney Lake area and decided to spend some time at Viamede Resort. We picked this resort for its location and so we could enjoy a room with a view of the lake. 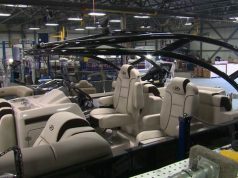 They also had a rental fleet operated by Town & Country Marine that included aluminum fishing boats, pontoons and bowriders. We were fortunate enough to be set up with a brand new Monterey 214. After checking in to our rooms, I met up with the resort’s general manager Ben Samann for a tour of the facilities. 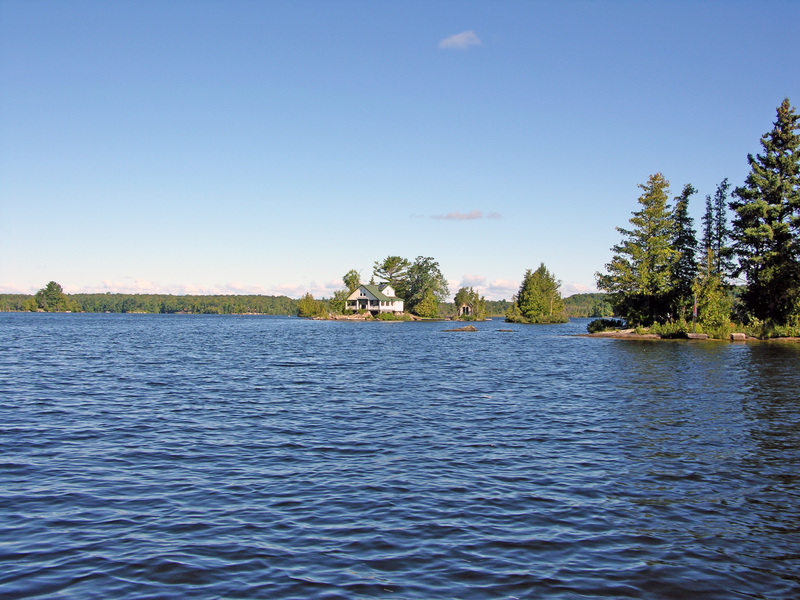 Viamede offers an array of accommodations from rooms in the main inn to cottages along the shore. For a different experience, you can also stay at their adjacent property, the Inn at Mount Julian. Built in 1865, the inn operates a small farm on site, raising their own pork and growing vegetables and herbs that make their way directly to your plate in the dining room. You can enjoy the pool, hike trails, try out a kayak or canoe, and of course rent a boat. Stoney Lake is arguably the most scenic of the Kawartha Lakes. On our first day of exploring my wife Lisa and I headed out on to Stoney Lake, arguably the most scenic of the Kawartha Lakes. Stoney is aptly named, with its rock islands, rugged shoreline and many shoals. A good chart is an absolute must to navigate the small craft route and explore its reaches. Tucked in the trees on the mainland and on the islands are cottages of all sizes and vintages. The lake also has other resorts like the Irwin Inn and some interesting stopovers like Crowes Landing. A short walk up the road from the public docks at Crowes Landing you will find the Stoney Lake Market. 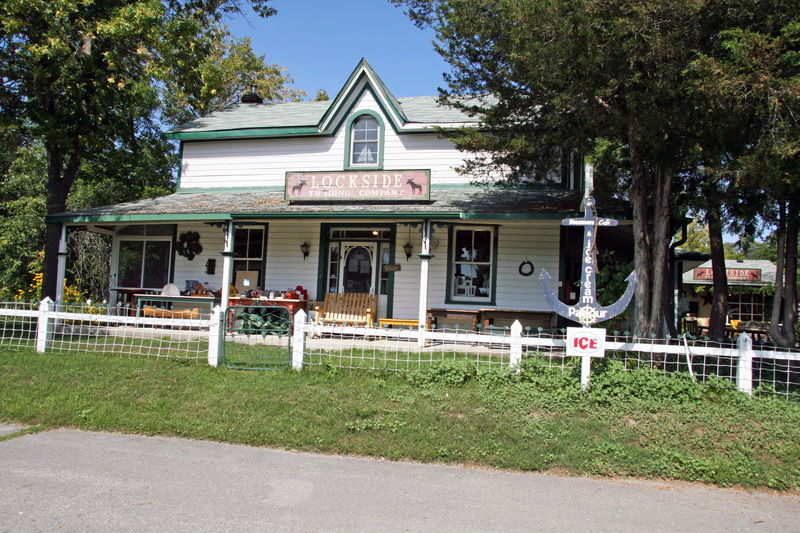 Inside is a wonderful general store with everything imaginable – from staples to treats, dairy and deli. There’s also interesting finds and artwork for sale in the loft studio. But we had come for food and refreshment, so we grabbed some pizza and topped it off with a little ice cream. Having enjoyed lunch, we headed back out on the water to cruise through the islands and Boshings Channel towards our next landfall at McCracken’s Landing. Mid-0eek and after Labour Day, we were one of only a few boats on the water. As we cleared Juniper Islands, not a boat could be found at the public docks located at the end of the island. As we approached, I was pleasantly surprised by the changes on shore at McCracken’s Landing since my last visit to Stoney Lake in 2007. The old Choate Supply Store that dates back to 1897 has been replaced with a new building complete with a lighthouse. Here you will find the new store, a restaurant and a great view out over the marina and Stoney Lake. Leaving for Clear Lake, the small craft route takes you through some great twists and turns past the rock islands and shoals in an area called Hell’s Gate. Keep your camera handy and take your time since this is one of the most picture-worthy passages in the area. Clear Lake is five miles of wide-open running, so you can enjoy the wind in your hair without any speed restrictions. 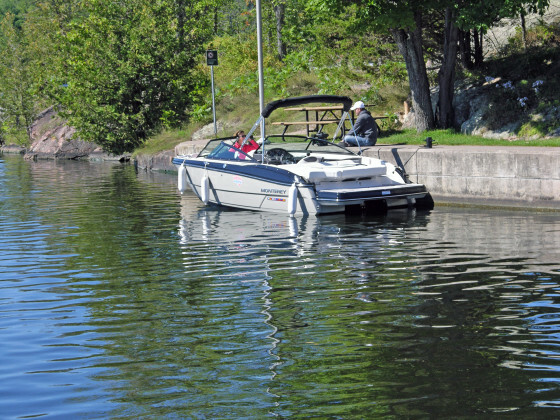 Formed during construction of the Trent-Severn Waterway, Clear Lake is five miles of wide-open running, so you can enjoy the wind in your hair without any speed restrictions. Just don’t go too fast or you may miss some of the amazing cottages lining the shores. One of my favourite stops is at the end of Clear Lake. Wind your way up the river to the Youngs Point Lock and the old lockmaster’s house that is now home to the Lockside Trading Company. Here you’ll find an eclectic courtyard to relax in while you enjoy something refreshing or tasty from Steamers Café and Ice Cream Parlour. I have to admit, we have never come away from Lockside without buying something since the collections of home décor, gifts and clothing are excellent. If you can, plan on attending the Lockside Blues Festival in June. After a busy day out exploring, we returned to Viamede for a relaxing meal and a good night’s rest. The next morning we headed west on Stoney Lake, once again threading our way through the islands and past the most challenging area on the lake, Hell’s Gate. Not only do plenty of shoals make this area a navigational challenge, but it also the intersection of three routes. As you pass from one route to the other, the red markers switch sides as you change from heading “upstream” to “downstream” or vice-versa. The lake opens up a bit once you’re clear of the Hurricane, a passage around Hurricane Point on Fairy Lake Island. In short order, we were just off Burleigh Falls where the river flows down over the rocks into the lake. The water flow was modest since it was late in the season, but in the spring it really is something else. 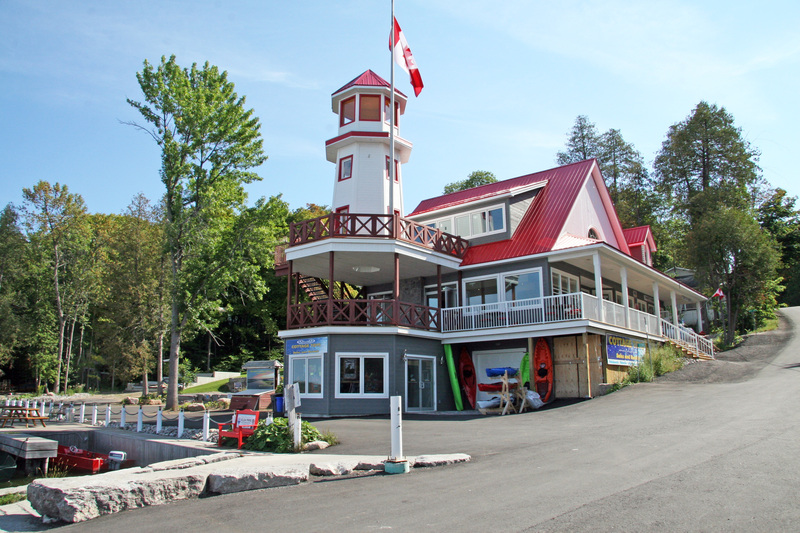 If you need fuel and a break, you can pull into Burleigh Lodge Marina between the falls and the lock. On shore, there’s a restaurant and bar with a view of the lake that can be enjoyed from indoors or on the patio. There is also a general store next door. 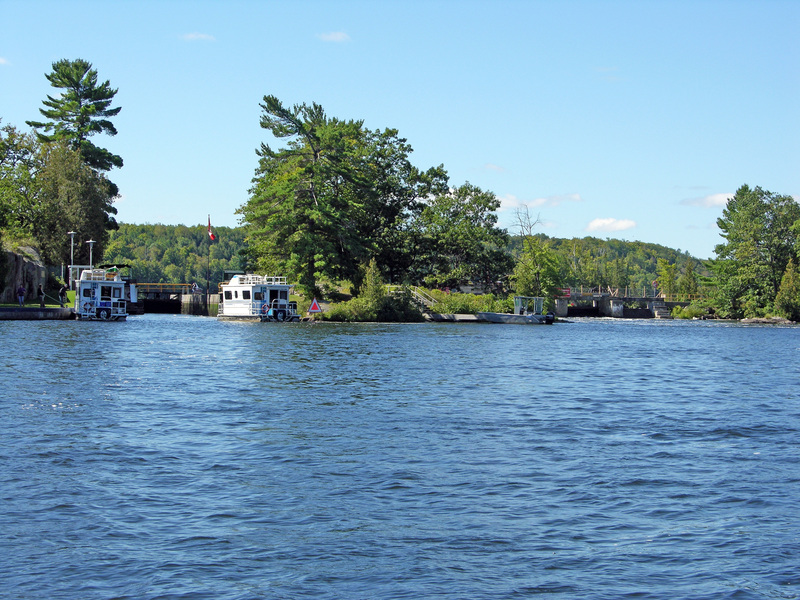 Within minutes of departing the marina, we were turning into the approach to the lock at Burleigh Falls. We tied off on the blue line and wandered up the lock to enjoy the scenery and the foliage as the fall colours were just starting. 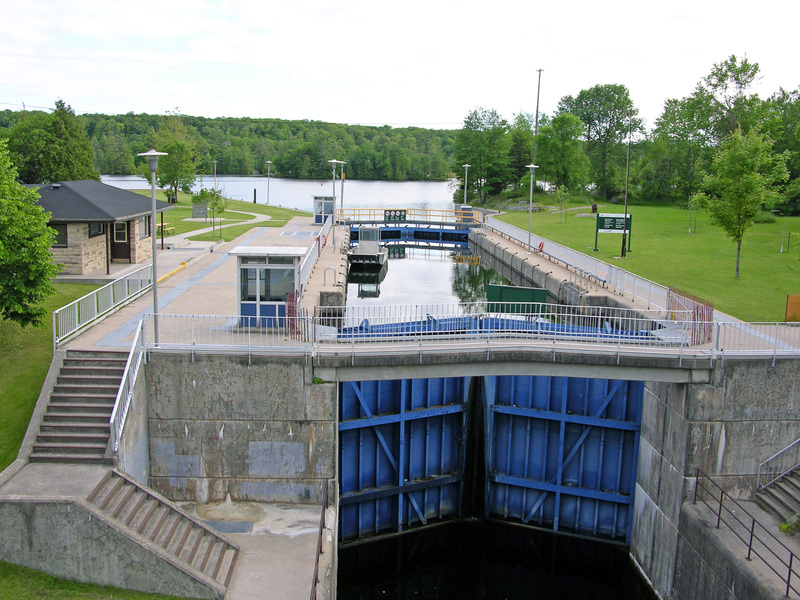 Lovesick Lock is one of my favourite stops on the Trent-Severn for a lunch or overnight. Once we locked through, we were on to Lovesick Lake. Soaking up the sun and sights, we picked our way through the islands heading towards the next lock hidden at the top of the islands. Lovesick Lock is one of my favourite stops on the Trent-Severn for a lunch or overnight. Tie up on the approach if at all possible. What makes this lock so endearing is its isolation. With no roads nearby, all you hear is the sounds of nature – the wind in the trees and the water cascading over the dam from Lower Buckhorn Lake and flowing by on Wolf Island. 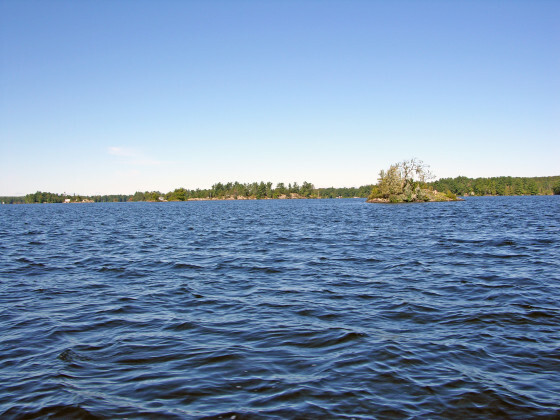 You can camp at the lock or anywhere on Wolf Island, which is a wilderness Provincial Park. Departing Lovesick, we were soon clearing the islands on Lower Buckhorn Lake and cruising into the open waters of Deer Bay, making a side trip for lunch. 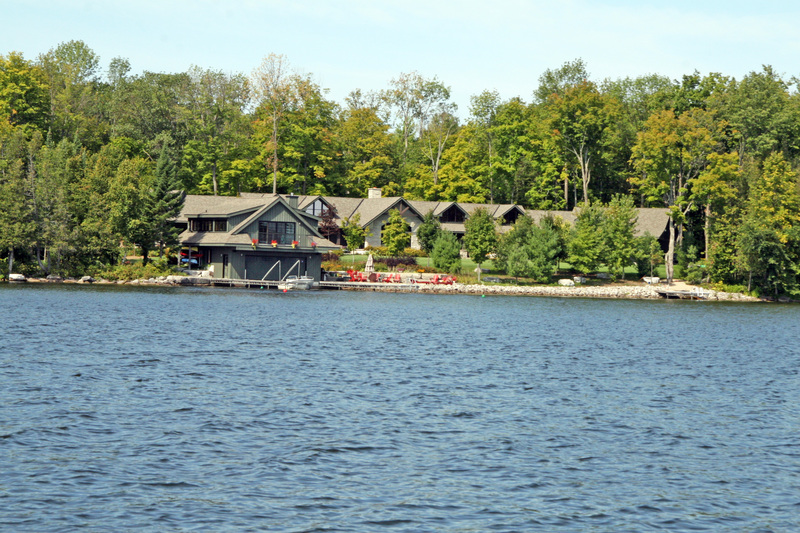 The white buildings of Beachwood Resort were easy to spot from the water and we were quickly docked and headed ashore. 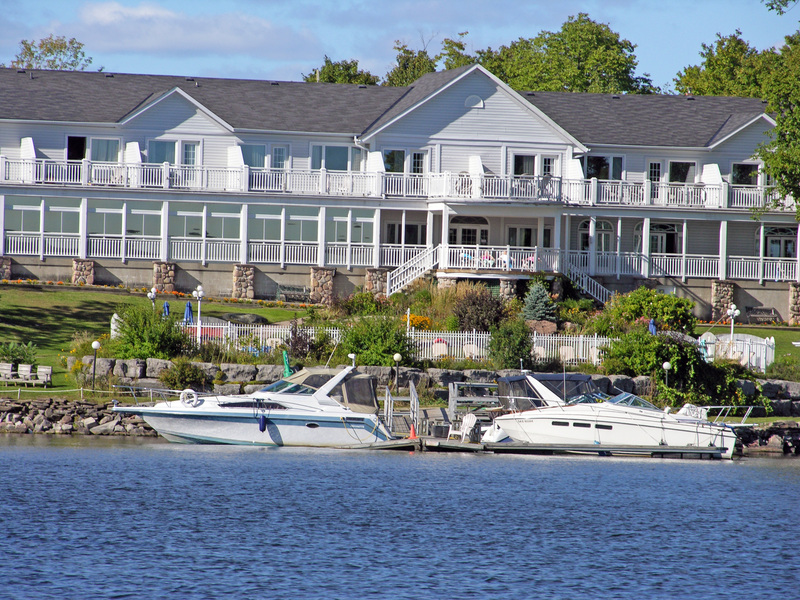 A classic Kawartha family lodge, Beachwood is a great place to stay while exploring the local waters. The comfortable lodge offers a variety of accommodations and the dining at Fredericks’ is first rate. After a great lunch, we headed up Lower Buckhorn past Reach Harbour Marina searching for the Gallery on the Lake. Clearing the marker off Tobico Rock, you can see the gallery and its dock on the north shore. Your boat will need a shallow draft and you’ll have to post a bow watch on approach through the shallows but the effort is worth it. Inside the distinctive building you will find one of the finest collections of original artworks in Canada. 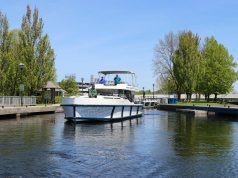 Back on the water, we enjoyed a short but scenic cruise along the Trent-Severn Waterway small craft route on our way to Buckhorn. While waiting on the blue line for the next lock through, we spent the time enjoying the beautiful setting you find at all of the Parks Canada locks. On the other side of the lock, we passed the village of Buckhorn, where you will find a great waterside restaurant and a few shops. With the locks closing earlier in the fall, we kept our cruiser around Buckhorn Lake quick then called it a day and headed back to Stoney Lake and Viamede Resort. Having been a cruising boater for over 25 years, I was a bit surprised at how much we were enjoyed our day boating excursions. Heading out by road with a boat or personal watercraft in tow could really expand our horizons and allow us to explore lakes and rivers that we would not be able to get to or have the time to cruise to with our 36 Regal. Add the flexibility of being able to rent a boat and enjoy the comforts of a resort or bed and breakfast, along with shops and fine dining on shore, and we will definitely be heading out day tripping by boat again this summer.